Dave had coaching from myself a year ago and wanted to push his riding on further and his mate Andy joined him for the session as they ride together loads. I ran them through the skills check and found I needed to work on Dave’s body positioning and Andy’s looking and body position too. I made the necessary set up changes to assist these and showed them why too and then we set off to apply the skills. The drop technique was first up and it didn’t take long for them to get all 3 drops dialled. We moved onto the skills trail and worked on the 14 sections the are contained within it. Pre jumping, flat. bermed, off camber and switchback turns, rock gardens, fly out jumps, steps and drops were all linked together via the correct braking areas. Their new skills began to shine through and any errors were now self identified as they now knew why it was right or felt wrong. I worked hard on braking and line choice when linking fast drops into corners and soon they were riding it end to end way faster than ever. I wanted to worked on riding down steep stuff and also how the skills applied to riding very steep drop offs too. Finally, it was time to teach them how to jump tabletops and using a 6ft tabletop I demonstrated as always and then they followed suit and soon they were clearing the tabletop with ease. They then used their mental skills questions to decide positively to ride the 6ft gap jump too! Our session came to a close soon after as they were both mentally drained by then. 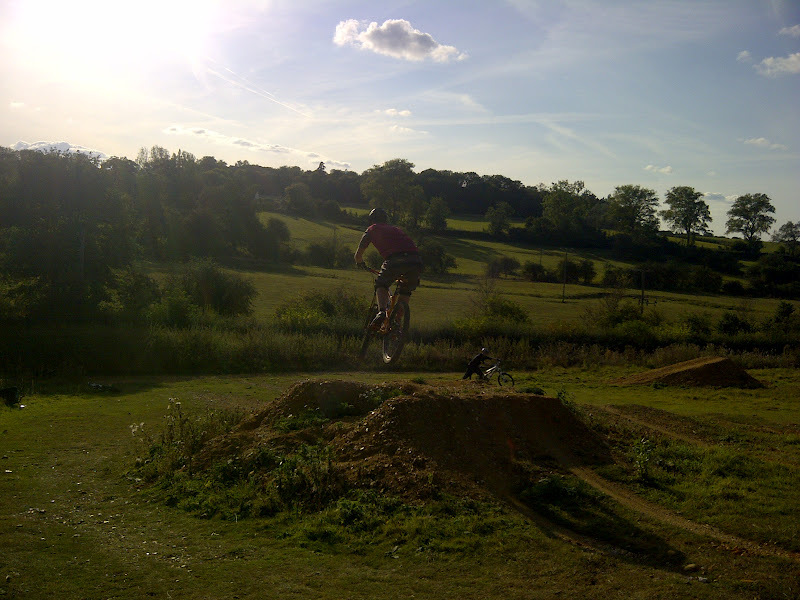 Amazing session to end a great week of coaching and riding. Hugh made the trip from Monmouth and on meeting I could see I needed to set up his bike and Change a few things around. The skills check revealed that I needed to work on his missing looking and body position skills and also the mental skills too. We began with the drop technique and Hugh was very methodical and spent time getting each one perfect over and over again before moving up and eventually he rode all 3 drops with ease. We moved onto the skills trail and began with pumping undulations on the trail and we used this gained speed to ride the next berm and flat corner. It didn’t take long before I added in a rock garden, berm and switchback into the mix and Hugh rode them and already was identifying any errors himself as he now knew why. I moved onto the fly out jump and corner with a step on the exit and Hugh was surprised at how easy it was to get up into the air and whoops of joy rang out when he got it right. We added all the previous section to it and Hugh rode them with regained confidence and commitment. I worked on the end of the trail and its corner followed by drop section into a final corner. I worked on braking technique and line choice and soon it was time to ride the whole trail end to end. Each complete run was faster and smoother than before. I could see he was tiring but Hugh wanted to learn why the skills set applied to jumping tabletops so we worked on that. In a few small steps and much to his surprise, Hugh sailed over the 6ft tabletop which capped off an awesome session as he was mentally drained by the adrenaline of jumping. Karl had a gift voucher for his session and nearly a year later our paths finally met. I found I needed to work on his looking, body position and mental skills during my skills check and I set to work. To Karl’s surprise, drops were first on the menu and it didn’t take long for him to ride all 3 drops with ease. From there we moved onto the skills trail and the 14 sections contained within. Pumping, rock gardens, jumps, steps and drops were all linked to flat, bermed, off camber and switchback turns. It didn’t take long for Karl to link the trail together and any errors were self diagnosed and he moved though conscious action. I moved us onto another technique where I worked on his body position, steep stuff. Karls’ new body position on his bike gave him way more control than ever and it reflected on his riding as he rode the drop offs I demonstrated to him. We covered jumping tabletops, gap jumps and manuals later in the session and ended with hopping over tree stumps using the skills set I teach and It blew Karl away how easy it now was. Nick booked the session for himself and Tony, Justin and Martin joined him on the session. Group sessions with riders that ride together are always interesting as I can get them to use each others strengths and they learn as a single entity. I found they needed all parts of the skills worked on , both physically and mentally but a few set up changes and off we went to apply the new skill sets to techniques required in mtbing. I worked hard on body positioning throughout and as we began with drops they found them very easy indeed. I moved onto the skills trail and their new footwork, looking and body positions were applied in all 14 sections of the skills trail. Pumping, rock gardens, steps, fly out jumps and drops were linked by the correct braking areas to flat, bermed, off camber and switchback turns. We moved down the trail working on isolated parts of it before finally riding the whole trail end to end a few times. The change in them all was dramatic as they now confidently rode fast and with greater control. They wanted to learn to jump tabletops for when they go away on alpine holidays so I moved to the 6ft tabletop and gap jump. In no time at all they all sailed over the tabletop. They then used their mental skills that I teach to decide individually, to ride the 6ft gap jump too! A few runs later and over 5 hours from the start, I could see mental fatigue creep in and our session ended to a tour of the skills area. Andy, Shameer, Paul, Chris, Colin, Mark, Gavin and Tim turned up as arranged on a wet and windy day for the drops and jumps session. I ran them through part of my skills check and found they all needed work on their looking and I changed their set ups and showed them why I did so too. We began with applying the physical and mental skills sets to the drop technique and later I gave them some cornering advice to enable me to teach them to link both the cornering and drop technique on a trail. We moved onto a fly out jump to begin to apply the skills to jumping and later onto the 6ft tabletop and gap jump. Some of them were clearing it quickly and the others were moving along nicely when the wind changed so I moved them onto riding drop offs and various ways of tackling them. I worked hard on their body positions in all aspects of their riding and moved them on to the pump and jump trail to work on pumping undulations on the trail. As the wind was still a side wind I worked with them on linking corners on singletrack and they rode down the skills trail and linked the drop into the final corner with ease compared to when we began. The wind died down and we moved back to the tabletop and 6ft gap jump and all riders got across it and some used their mental skills questions that I teach to decide to ride the 6ft gap jump! They were all mentally drained and the session came to a natural end so we went to the local pub to celebrate an awesome session with a pint each. Lou, Dave , Barnaby and Ben turned up as arranged and the skills check showed me that I needed to work on theor body positions and looking skills, I made some set up changes and off we went to apply the skills. I began with the drop technique and they all rode the 3 drops with ease and commented on how easy it felt. After a cornering correction excersise, we moved onto the skills trail. Pumping, flat, bermed, off camber and switchback turns were linked to rock gardens, steps, jump and drops. Soon they were riding the whole trail end to end and linking each section together smoothly. I moved them on from there and worked on riding steeps, I used various sections and showed them different ways of dropping into steep drop offs. They all rode them and the ease of it all really took them by surprise. I could see that they were tiring but I wanted to move them on so I moved them to the 6ft tabletop and in a few short steps they all rode the tabletop. They used their mental skills questions to all decide to ride the 6ft gap jump too. The session came to a close soon after to a tour of the herts skills area. Awesome session guys. Rudi had been coached by me previously and wanted to share a session with his riding buddy Liam. On meeting I ran them both through my skills check and found I needed to work on their looking, body positioning and footwork in all areas of the check. We began with the drop technique and it was here that I worked on their mental skills too and soon they were landing all 3 drops easily and perfectly. Rudi rode the 6ft tabletop as I had taught him to jump previously and Liam wanted to learn that too so I obliged and soon they were both sailing over it. They used their mental skills questions to positive effect and they both then rode the 6ft gap jump side too! This was the theme for today as they both bounced off each others successes. From there I moved them onto the skills trail to work on cornering and carrying speed and absorbing sections. Flat, bermed, off camber and switchback corners were linked to drops, rock gardens, pumping, steps and upslopes. They really got to grips with the trail and was soon linking the whole trail together nicely. I could tell they were tiring from the physical aspect of the climb to the top of the trail so we moved onto riding steeps. I worked on their body positions here too and as ever demonstrated too. I used various slopes from 40ft high and one that is nearly vertical too. I showed different ways of riding into steep stuff and the lads followed suit. They were blown away at how easy it was but I promised them I’d teach them to manual through jumps earlier and I wasn’t going to let them down. In a couple of minutes, both Liam and Rudi were manualling over a 9ft tabletop and loving it! On request, I then demonstrated to whole line to them including the 20ft+ gaps of air supply to them and that ended our session as they were mentally and physically knackered. We celebrated the session in the local pub with a cold beer. Amazing riding guys.